On the eve of the much awaited iPhone 7 launch (it is today too, actually) LG have let loose their own beast: the premium successor to last year’s LG V10. LG V20, everyone. The LG V20 comes after LG’s modularity attempt with the LG G5, which didn’t catch on as much as the recent Moto Z twins, what with the purpoted boot-loops, bricks and general instability. That is a different line, however, as the V-series LG phones have had their own flags to fly; magnificently at that. The LG V10 was a king when it came to mobile videography. It sang along to the audiophiles’ tunes too with superior audio capabilities, reminiscent of the old HTC One audio prowess. It was severely underrated though, unlike the iPhones and the hot (pun) Samsung boys. So, the LG V20. Is it as good? Is it better? Well, first things first, this is the first (ahem) phone to come with the still-new Android 7.0 Nougat bundled, apart from the Nexus devices, obviously. But this is amazing! This is a badge in LG’s blazer and they should rock it so. HTC was the first to release a device with 6.0 Marshmallow last year: the HTC One A9. As it has been the trend of late the Nougat copy in the LG V20 is pared down. It is much cleaner, with vanilla Android shining through a bit more. No App drawer for you though, among other changes. The LG V20’s look gets more from the LG G5 than the LG V10. It has a metal build, (albeit removable back cover) and a not-so-strange face. The front of the LG V20 basically looks like the Blackberry Z10 (I loved this one). Out back, there is a fingerprint sensor/home button. There is a button at the bottom right corner that pops open the removable metal back cover. Clearly, LG’s modularity efforts are not for the V-line of devices. The top and bottom segments of the phone are built with silicon polycarbonate (like the infamously finicky G5) with combined use of AL 6013 metal to make up the device. Apparently, this holds up better than full-metal builds in drops. Android Authority calls this build ‘more premium’ despite the mix of polycarbonate and aircraft-grade metal, in comparison with the full-metal LG V10. Obviously the star of this show is the Always-On strip of display above the main screen. That, folks, is still here. The same functions abound (app shortcuts, notifications & signature) and this time it is brighter, sharper and will allow more content shown on it. 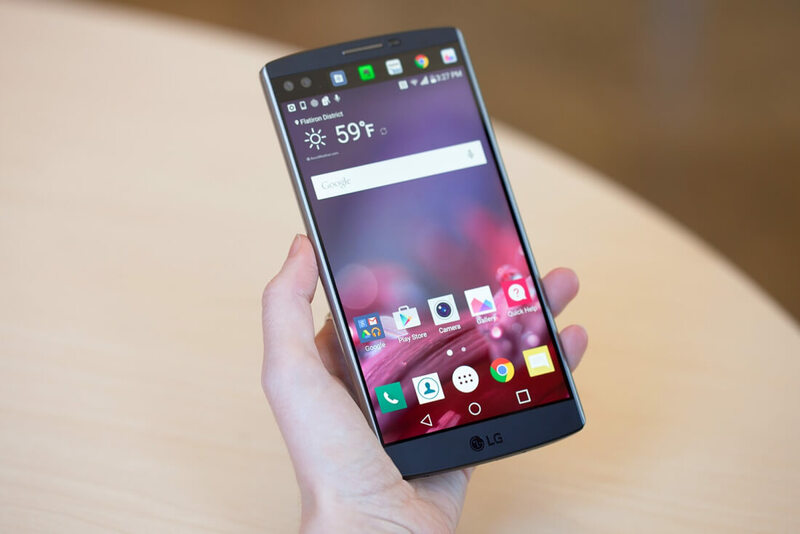 The LG V10 comes with a 5.7-inch Quad-HD IPS-LCD face with a Gorilla Glass 4 (Not GG 5) over it. The LG V20 has a dual camera setup consisting of a 16MP f/1.8 sensor and another wide-angle 8MP f/2.4. Add in a host of hardware and software trickery (EIS and DIS Image Stream Analysis, Steady Record 2.0, manual video control) and you have a fine camera experience with the V20. Under the hood, the LG V20 sports the 2016-norm Snapdragon 820 4GB RAM and 64GB of internal storage. This means the V20 is as fast and lag-free as a 2016 flagship should be. It supports microSD up to a whopping 2TB. USB-C settles the USB worries here and the signature LG removable battery has 3200mAh capacity that is juiced up with Quick Charge 3.0. The LG V20 is not water resistant. The LG V20 will be available globally later this month but pricing hasn’t been announced yet. It does, however, have some tough competition with the new iPhones being launched today, the Note 7 and the new entrants that are coming into the market soon.